View of the ruins of Tavistock Abbey in Devon. The abbey was founded in 961 and went on to become one of the wealthiest and most important Benedictine houses in the south west. In 1525, one of the first printing presses in England were established at the Abbey. 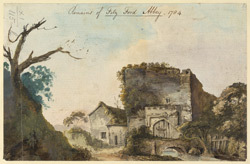 It was dissolved in 1539 and the abbey estate was granted to John Russell, whose descendents were later to become Earls and then Dukes of Bedford. . As can be seen in this print the main medieval building still standing is the gatehouse. Tavistock the town grew up around the abbey precincts.